Where do I use my Alive and Dirty voucher code? 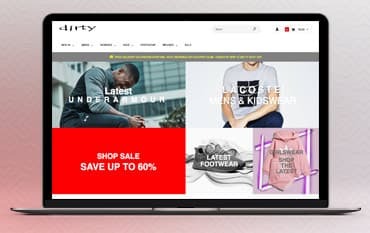 You can discover a huge array of men’s fashion and accessories at Alive & Dirty including hoodies, jackets, coats, jeans, outdoor pants, polo shirts, shorts, sweatshirts, t-shirts and tracksuits from top quality brands as well as a huge array of womenswear and boy’s football kits, jackets, jeans, polo shirts, shorts, t-shirts, track pants, tracksuits and hoodies in sizes 0-16 years. Alive & Dirty also have a great footwear section where you can find an array of big branded trainers, as well as a ‘new in’ section where you’ll find all the latest and most popular products. If you’re looking to save money on your order at Alive & Dirty you can always check out the clearance where there’s up to 60% off an array of fashion and footwear for men, women, children and infants. Alive & Dirty also have a ‘back to school’ section where you can find all you need for your child before they head back in September. Find winter coats, jackets, waterproofs, school shoes, trainers and hoodies for young boys and girls and teenagers too. Alive & Dirty know that things easily get ruined, lost or outworn at school which is why all of the fashion and footwear available at Alive & Dirty is from huge big brands that you can trust including Adidas, Berghaus, Columbia, Ellesse, Emporio Armani, Kickers, Luke 1977, Lyle & Scott, Patagonia, Tommy Hilfiger and many more. In the footwear section at Alive & Dirty you can find trainers for men, women, juniors, children, infants and girls from brands like Adidas, Asics, Berghaus, Birkenstock, Calvin Klein, Ellesse, Emporio Armani, Kickers, New Balance, Nike, Patagonia, Puma, Timberland and Under Armour. You can find trainers in all kinds of colours and sizes and many of which are also ideal for school or sports. Discover a huge array of kidswear for boys and girls aged 0-16 years at Alive & Dirty. Browse through section for boys aged 0-3 years, 3-7 years and 8-16 years and find football kits, hoodies, jackets, jeans, outdoor pants, polo shirts, sweatshirts, shorts, t-shirts, track pants, tracksuits and footwear from brands like Kickers, Adidas, Nike, Birkenstock, Hickies, Lacoste, New Balance, Nike, Reebok, Timberland and many more. You can also discover a selection of kidswear with up to 60% off in the clearance section too. If you would like to arrange a refund please contact Alive & Dirty. Alive & Dirty are a retailer of stylish designer fashion and footwear for men, women and children. You can discover casual, everyday clothing, footwear, sportswear and back to school kids wear from top brands like Nike, Adidas Originals, Under Armour, Ellesse, Asics, Birkenstock, Calvin Klein, Emporio Armani, Lacoste, Tommy Hilfiger, Timberland, Puma, Reebok, New Balance, Berghaus and many more. And if you shop online with an Alive & Dirty discount code from us you can save money on all these brands too.